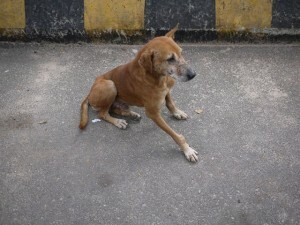 In Bangalore, all of the street dogs that I saw were similar. Tight, short fur, about 25 pounds, and generally the same size and shape. I thought that was strange. In the US, the stray dogs come in many sizes, shapes, and colors. 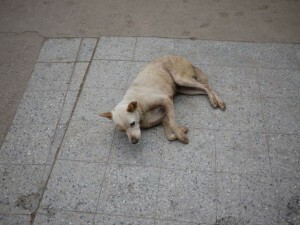 The US strays are usually mixed breeds, either un-wanted, lost or feral. Since then, I’ve come to learn that these aren’t stray dogs as we in the US are familiar (you know, like from Lady and the Tramp). These are actually called “Village Dogs” and are a distinct family of dog types. Our pet dogs were once wild, then domesticated by our ancestors. The dogs were selectively bred to create new breeds. Not so with these village dogs in Bangalore. These village dogs are wild, though have evolved to have a symbiotic relationship with humans. The wild dogs learned to hang out in villages and scratch out a living along-side human settlements. National Geographic recently featured several cool articles about dog DNA and the origins of our favorite breeds. One of these articles introduce me to village dogs, describing the research being performed at Cornell University. Funny what you can learn while waiting for the doctor. This entry was posted in Uncategorized on July 28, 2012 by John Ruberto.